When you stay at H Plus Hotel Willingen in Willingen, you'll be 10 minutes by car from Sommerrodelbahn & Sesselbahn / Skilifte Willingen. Featured amenities include complimentary wired Internet access, a 24-hour front desk, and an elevator (lift). Free self parking is available onsite. With a stay at Swarg Apartments in Bamberg, you'll be within a 15-minute walk of New Residence and Bamberg Cathedral. 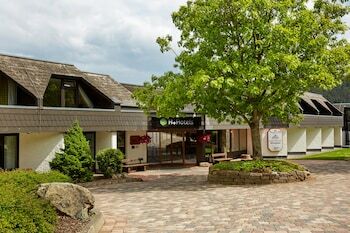 With a stay at Hotel Am Sportpark in Duisburg (Duisburg Mitte), you'll be a 4-minute drive from Schauinsland-Reisen-Arena and 9 minutes from Six Lakes Park. Free self parking is available onsite. Located in Cuxhaven, Villa Döser Strand is by the sea, within a 5-minute drive of Cuxhaven Beach and Schiffsmuseum Duhnen. Self parking (subject to charges) is available onsite.